Step 1- Find some pretty white flowers. Step 2- With a sharp knife and a superhuman steady hand, split the end of the flower's stem into four sections and put each section in a different cup of colored water. 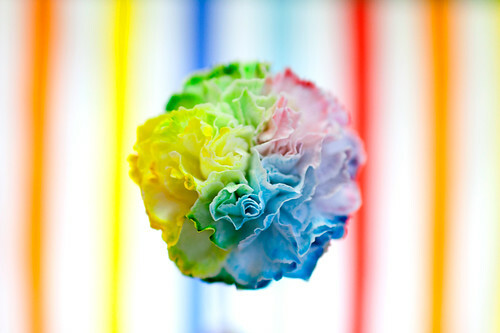 You've just made some awesome rainbow flowers. Such an awesome idea! Will sooo have to try this. 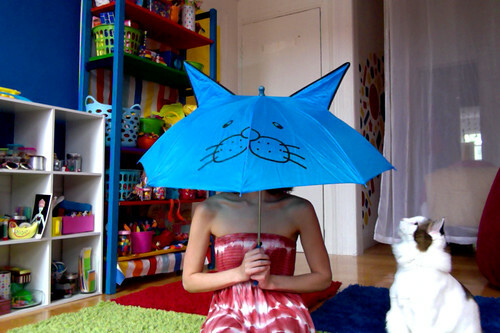 That cat umbrella pic is so adorable. This is cool. My son and I just did this with celery and had a blast! The leaves are so beautiful if you leave them in a few days. I've been wanting to do flowers, and now you've reminded me again. Thanks! and this thing really works??? They look just lovely!! Thanks!! I remember doing this as a child! It's so cool. Yours turned out so well. Always im in doubt if this really works, gonna try someday, adorable. 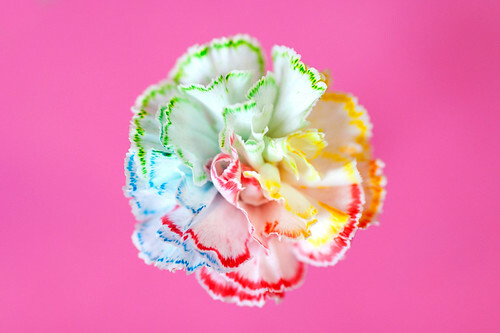 I'm going to do this and give each of my friends a rainbow flower when they come over for our monthly game night. Thanks! oh my goodness this is just so fantastic - super cool! Such a great idea to get colorful! I love your color inspirations. You are so talented! So cool! How did you think of this? Totally going to try this now thank you! you make my heart dance and twirl and do flips. This was the best thing I saw all day. You're delightful. I tried your crayon experiment. Love your rainbow flowers! Love the constant creativity on your blog. This is adorable, I will have to try it soon! That is absolutely brilliant and bright. This is just so brilliant. I always heard about it but never thought it worked - looks like I'm going to have to try it! Oh wow they look so pretty - I have to try this! OMG how easy and how LOVELY! Thanks - you're a star! Wow they look actually amazing!! So pretty! Do you have to leave them in the coloured water or once they've turned that colour can you put them in normal water? That is so cool! I can't wait to try it!! Beautiful. What did you use to colour the water? I've done that with one colour before but it works even better with a couple of different ones. They look gorgeous! I had no idea this is possible! It's amazing! WOW! I must try this!!! What kind of paint did you put in the water? this is so fun and sunny! thank you katie!! Great idea! I've done one color before but never four! I love it! That's really beautiful! I only saw colorful roses since now and I didnt really like it but your flowers look amazing! Fantastic idea, gotta try this! So beautiful! And Moo is too cute, as always. there is 69 comments, ooops make that 70 sorry jokes ovr!! This is idea is brilliant! you don´t get depressed very often, do you? So simple, yet so cool! Omgsh that's so prettyyyyyyy!! You're amazing. Seriously can't wait to try this out either today or tomorrow! Buying some flowers now! 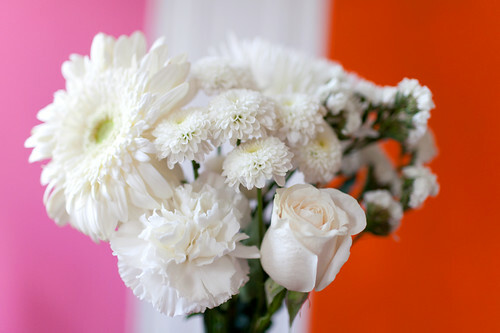 What are the products you used in your collection of flowers in your blog? These are stunning! I can't believe how amazing they look! What type of colors you used in your flowers designs? I think your collection of flowers is informative for me and i would love to use it. I don´t think so!!! is awesome!!! I really love how each of the flowers an original and you cannot possibly make two the same. I had done it with celery but doing it with white flowers was a really good idea. Acutely I just really love you blog, its taking me agers to write this 'cos I keep looking at things that I’ve already looked at. I love how you use colour, not just in this post but in all of them and how you do all of these things that put a smile on people’s faces (knowing that it does puts a smile on mine :D). I love your creativity. I am going to try this today! SO FUN! wow. i love this! so crazy cool. 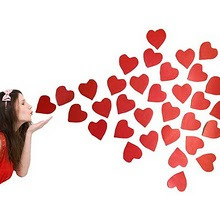 Love love love your posts-all of them. They make me smile@!! Your colourful posts and creative ideas lightening up my day! That is fantastic!!! Really like the idea!! Wow. They look like fireworks in broad daylight. I love how the baby breath turned out. Can't wait to try this, thanks for keeping us all inspired! Very nice flowers thanks for sharing the blog.Keep on update the blog. the colours here are really awsome. wow, these are wonderful :) im definetly going to have to try this out! every can't made this type of crafts, you have performed great creativity. If any person have unique creativity and good imagination so they can made many new arts and crafts, and i can say after see your crafts that you have both. rainbow flowers looking extraordinary. Thanks for sharing. Love this. 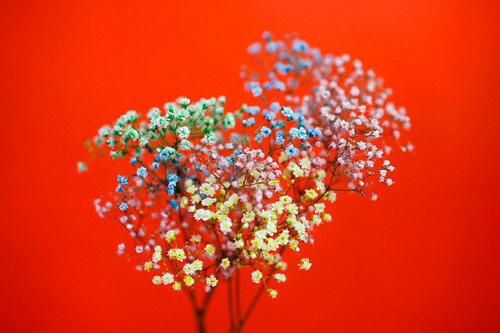 Recently discovered Happy Roses (http://www.happy-roses.com/photogallery/rainbow_roses), which are beautiful but pricey! Definitely want to try this DIY sometime. Interesting! I didn't know you could do that. :) Hi Katie, I'd like to know what kind of paint did you use? 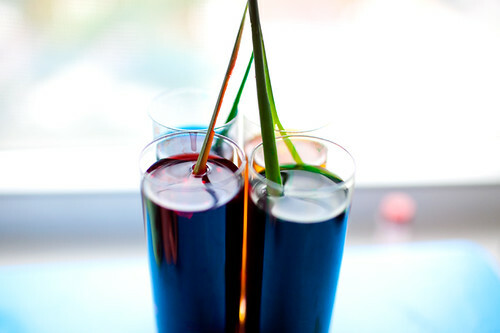 Can you use food coloring? Some great photos and designs here, where do you get the images from? Do you take the pictures yourself? Damn woman, I think you are the most amazing person I've ever come across in my entire life!! *_* If only you were my neighbor! Or my sister! YES! 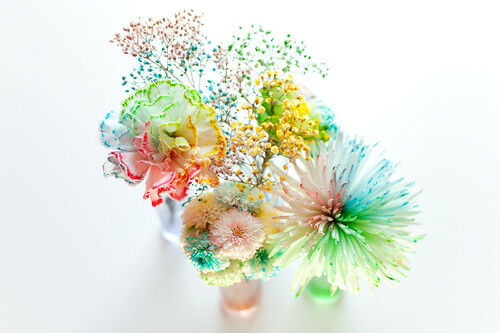 These rainbow flowers are awesome. I appreciate your art. Wow, really charming blog. I just love this and have collected my rainbow flower from at PIJ. I really happy to get this one. WOW !! I always wondered how this was done. I have seen colored carnations in stores but usually only one color. I like the different colors. I am going to try this its awesome ! Nice post..lovely flowers and bouquets ! !